Day 2 AND a restaurant report. Last evening rocked — primarily because I was not in the kitchen! I didn’t even see or hear a child from 6:30 until I went to bed (at the late night partyin’ hour of 10:30 — I’m like a rockstar). My own evening started at a friend’s going away party — I’ll miss you, K! 🙁 — at a local Mexican place. I didn’t eat there but had a Real Food-friendly beer with a lime — not organic, I imagine — but at least a lime is a 100% product of nature. I really wanted to have a Margarita. Add that to the priority lists of foods I must find an all natural alternative for. ASAP. Later, I met some other friends at a favorite local place — 800Degrees / Three Fires. Following Our Rules, I didn’t eat the pizza or the bread (because it’s not whole grain — though I know they are delicious). 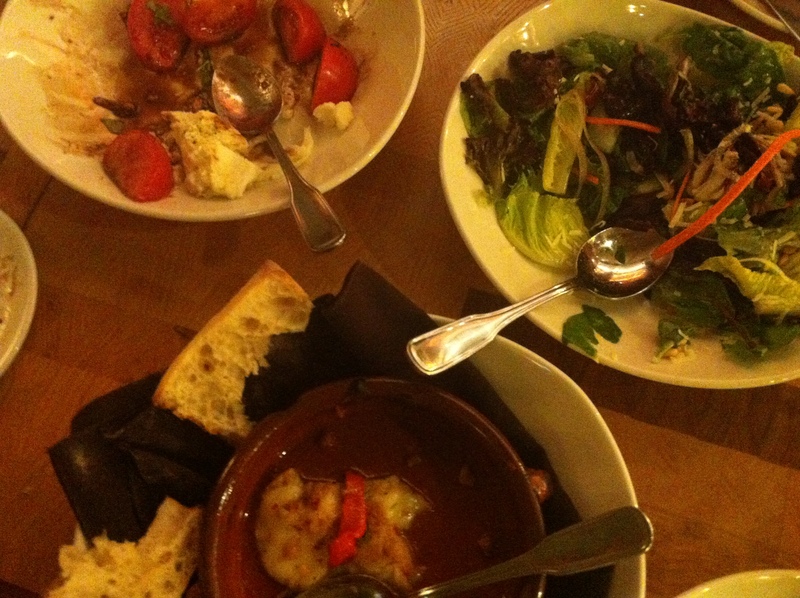 We shared some fantastic salads and starters. Next time I’ll remember to take the picture before we’ve demolished the food. Unfortunately, I didn’t even get a shot of the evening’s favorite — a grilled Butternut Squash salad — before we had devoured it. Bonus, it seems like something I could easily recreate at home: grilled squash slices on top of arugula with feta crumbles and a vinaigrette. Pictured is about the half-way point into our Mista Salad, Caprese Salad, and the completely addictive Provoleta: provolone baked in a little casserole with roasted red pepper slices, and — drum role, please — their locally sourced, made in house, pork sausage! It’s served with the bread, but I just cut big hunks of gooey, sausage-studded cheese out of the casserole and snarfed it down like a crustless pizza. So ladylike.